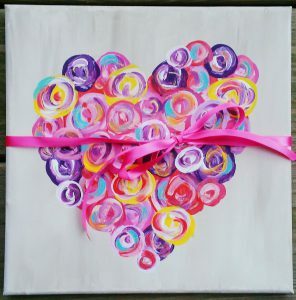 Join us for a Valentine’s Day themed paint night! We will be painting this colorful, fun, and easy picture-complete with a real ribbon! Even if you have never picked up a paint brush in your life, YOU CAN DO THIS! Cost is $20 per person with all supplies included. I would like to add 1 person. Yes please to make it 4. I would like to add another person to my registration please. I will add another to your registration. Thanks!